After three years of research and development, over 24 months real time field testing and several million Euro investment HELP International AG, headquartered in Mauren, Liechtenstein has introduced what it claims is the world’s first and only socially responsible DOOH solution, branded HELP – only it’s NOT the first, see Vital Sign Media’s DOOH with defibrillator first shown at DSE back in 2010, Ed. 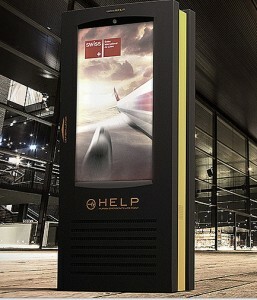 HELP stands for Human Emergency Life Point and represents a patent protected combination of a full outdoor DOOH communication device with a professional emergency lifesaving system including a defibrillator within a single unit. The HELP DOOH terminal offers either single or dual digital signage LCD panels running on an Apple Mac mini with software developed by VIDERO AG from Germany. Display sizes range from 55” to 82” portrait, and the HELP terminal is designed for toughest outdoor usage and operates even in extreme weather conditions without any difficulties, withstanding rain, dust, heat or frost during summer and winter. layperson lifesaving defibrillator of the latest design, accessible 24/7 – we will have a followup on what company’s defibrillators are used and other information later, Ed. The importance of having access to lifesaving equipment in the public space is because Sudden Cardiac Arrest also called Sudden Cardiac Death) has become a number one killer worldwide. In the U.S. alone, approximately 300.000 people lose their lives annually due to sudden cardiac arrest. Without first aid and the availability of a defibrillator, the average survival rate in the US is at 4% to 7%. However, HELP claims, the survival rate rises up to even 70% when the symptoms are recognized early and defibrillation and resuscitation is provided without delay, even by any inexperienced person with only basic knowledge. The company says that its mission is to draw attention to the problem of sudden cardiac arrests worldwide, the general lack of knowledge of how to help and by actively making a positive change to the public’s awareness. Its aim is to ensure that the public is better prepared to deal with an emergency and that panic is replaced with calm, in-action replaced with action, as well as providing the lifesaving equipment needed – in combination with a reliable outdoor digital-out-of-home communication system. HELP International AG has developed an educational awareness campaign, called the `HELP Life Program´ to fight sudden cardiac arrest. The key to its effectiveness is the constant broadcasting of short videos with instructions how to identify a Sudden Cardiac Arrest, how to help, how to resuscitate and how to use the defibrillator provided by any HELP terminal. HELP claims to offer the most modern full outdoor DOOH technology worldwide both in hardware and software with lifesaving as an outstanding added-value. The HELP system was developed taking advice from top professional medical personnel and in close cooperation with the Hungarian National Ambulance Service, the Hungarian Red Cross and the National Public Health and Medical Officer Service. An EU and US wide certified HELP training program completes the professional image of HELP lifesaving DOOH networks. This entry was posted on Tuesday, January 21st, 2014 at 07:01 @334 and is filed under DailyDOOH Update. You can follow any responses to this entry through the RSS 2.0 feed. You can leave a response, or trackback from your own site.